The Virginia Department of Forestry recently awarded their Virginia Trees for Clean Water grant to the Newport News Green Foundation. The Foundation plans to use the funds to continue their restoration efforts in the Hilton Ravine. The Virginia Trees for Clean Water program was designed to improve water quality across the Commonwealth through on the ground efforts to plant trees where they are needed most. Its specific objectives are to plant trees that restore and improve Virginia’s waters for the benefit of current and future citizens of the Commonwealth, achieve long-term improvements in water quality and to raise public awareness about the benefits of planting trees for the health of our stream and rivers. The Hilton Ravine, a pocket park located in the neighborhood of Hilton Village in Newport News, is characterized by large stormwater outfalls that collect water from the surrounding neighborhoods and deliver it to the James River located about 100 yards from the Ravine. In recent years, the City of Newport News has been working to upgrade the stormwater system in the Greater Hilton area which included the upgrade of a stormwater outfall in the North side of the Ravine. Unfortunately, due to the nature of the upgrade and of the equipment needed to complete the project, the landscape of the park on the North side was significantly changed. Several old growth trees, understory, and brush were completely demolished and the resulting landscape was barren. The Foundation, with support from the City of Newport News and the neighborhood group, Friends of the James River at Hilton Beach, will use grants funds to re-establish boundaries on the west side of the Ravine by planting a wax myrtle border, restore the canopy layer by planting six overstory trees, and replace three understory trees that have died (Eastern redbuds) in the past year. Volunteers can join in the final prep of plantings and help pick up liter on October 21st at 2 pm. More information and the link to register can be found on the Foundation’s website at https://nngreen.com/hilton-ravine-restoration/. 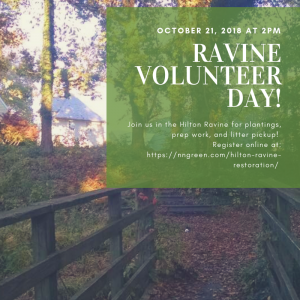 Can’t make the event, but want to learn more about Ravine Restoration or to make a donation to this project, visit: https://nngreen.networkforgood.com/projects/50026-hilton-ravine-restoration.